Effective marketing in the Subscription Economy requires a shift in mindset. Make the commitment to do things differently. I have a subscription or membership component to my business, even if the subscription isn’t part of the actual revenue model. I recognize that relationships are the most important competitive differentiator my business can have. I’m building something for the long haul. Whenever I’m tempted to pursue short-term gains at the expense of my subscribers, I resist. Instead of focusing only on how fast I can grow, I look at whether I’m attracting the right subscribers – the ones who get the most value from my business. I try to add value to every interaction with subscribers—even mundane interactions like shipping notices or welcome emails. I make it easy for subscribers to leave if and when they need to. I don’t hide the Unsubscribe button, and am quick to honor their requests to leave. I listen to existing subscribers. Although I cannot act on all of their feedback, I hear and thank them. I spend as much time thinking about how to best serve existing customers as I do about getting new ones. 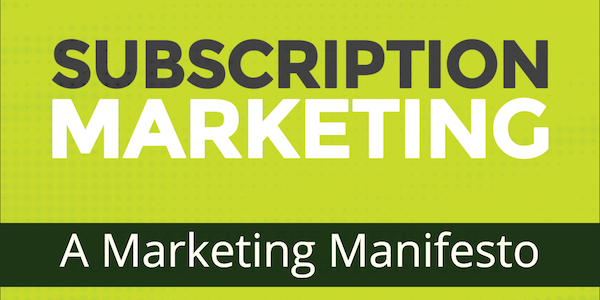 For more of the ideas behind the manifesto, see the book Subscription Marketing: Strategies for Nurturing Customers in a World of Churn. Interested in the changing practices of marketing? Want to nurture long-term relationships with customers? Join the list for monthly subscription marketing updates. Ready to improve your writing process? Sign up here. I'll send you a guide to overcoming common writing barriers. You'll also receive regular posts about better writing practices by email.